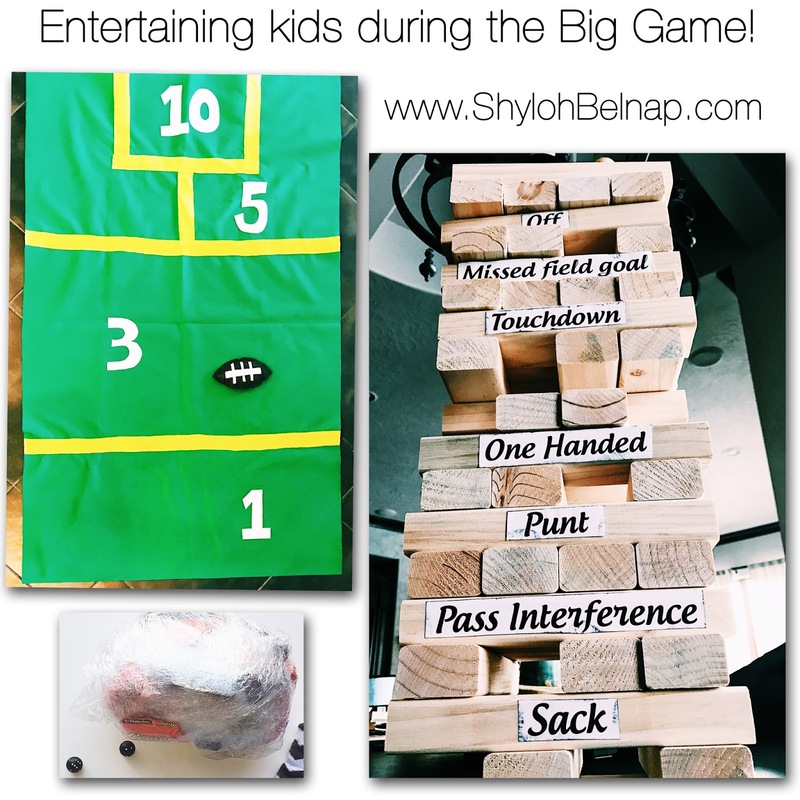 Shyloh Belnap: Ideas to Entertain Kids During the Big Game on Sunday! 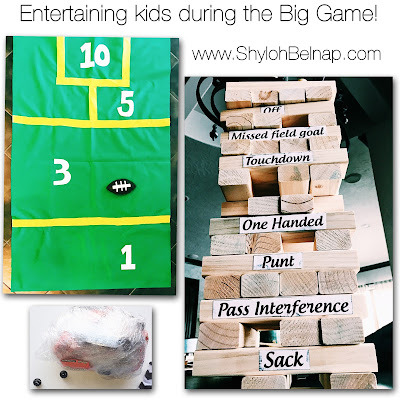 Ideas to Entertain Kids During the Big Game on Sunday! Kids can get bored while watching the big game, having a few activities to entertain them helps to keep both the parent and the child happy! I came up with a few ideas (and copied a one) that I thought would be fun! Jenga is fun all by itself. But, adding words to your blocks is an excellent way to add a little fun to this game. 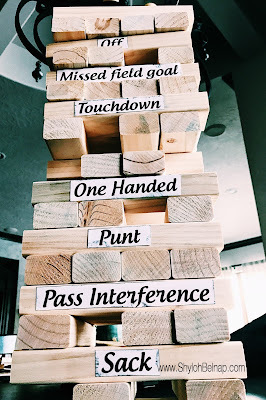 You can play this with any Jenga set but using the giant set is a fun touch to a party. Print words that pertain to the big game on each block. Some words that I used were: Champion, cheerleaders, coin toss, commercial, defense, defensive backs, downs, fans, field goal, football, fumble, soda commercial, beer commercial, the halftime show, passing, penalty, free kick, touchdown, rushing, car commercial, etc. When you see something that is on the block, you will move that block to the top of the stack. Try not to be the one who tips it over! Bean bags never get old, kids always love to play them! The yellow strips were cut to be 2 inches wide. Glue or sew them to the green flannel. For the rest of the pieces, I just cut them be hand. I have made a template you can use to cut out your pieces HERE if you would like to use it. Throw your bean bags on the mat. Whatever number you land on is the total score for your turn. First person to reach 30 wins! The first player will roll the dice up to 3 times. If they get doubles within those three tries, they put the socks on their hands and start trying to get candy! Before they start digging, they will pass the dice to the next player. They get to dig for the candy until the next player gets doubles. If they don’t get doubles, the dice just goes to the next player. It goes around the circle until the candy is all unwrapped and someone gets the grand prize.. the football inside!